The light flakes fall softly during the night. silently and stealthily. They cover the browns and greys, leaving the world pristine white. We wake up and greet the world: with shrieks of joy, or groans of despair. A winter wonderland is here, and the park is open for winter play in the snow – not for sitting on a park bench reading. How do you respond in the morning when you see the world has turned white? I LOVE this shot Colline! (I’m really enjoying your black and white work!) Just about all the places I’ve ever lived have been tropical or sub-tropical so waking up to snow is very rare for me. I has happened though….and my usual response is something like…WOOHOO!!! THIS IS SOOOOO AWESOME!! This is followed by throwing on some clothes completely unsuitable for snow and running out the door. Thank you Alex. I have always enjoyed taking pictures and am now starting to think carefully about my end product. I have moved from the southern hemisphere to the northern hemisphere and I must admit, waking up to a white world is a joy to me. I love walking in the snow – and feeling the snowflakes fall lightly on me. How cool! I’ve never been, but would LOVE to! I agree, very nice shot! I live in Calgary, Canada and if I didn’t like snow, it would be a hard place to live. My dogs love it too. When it snows, they frolic around in the backyard, bury their noses in the snow and eat it. But with a snowfall comes the necessity to shovel the sidewalk and poor road conditions. That part is manageable, but not very enjoyable. I just love it…that feeling when you open the curtains and see everything covered in white. And the plus point….my garden looks the same as everyone elses!! Seriously, what I love about the snow is the silence that accompanies it. It’s a beautiful shot, we haven’t had snow yet this year….I have got my fingers crossed and am waiting patiently!! We have only had two snowfalls this year: on the day I took this picture, and today. Winter without snow does not seem right. I love that photo Colline, just WAW! and guess what I’m dropping by to nominate you for the Kreative blogger Award: http://ranaarmoush.wordpress.com/my-awards/ Congrats! Thank you for the compliment Nia. Your photos are inspirational. Ahhhh…that is what I think when I see the world just after a snowfall. I love the winter. It looks magical. My evergreens are covered in an artistic dusting of white blanketing. I love to just sit by the window, cup of coffee in hand and daydream as I look out into the winter wonderland. The neighbourhood is quiet and it is a truly Zen experience. Rejuvenating. I love to walk the dog in the winter or just walk along the ravine paths and listen to the crush of snow beneath my feet, witness the steam of breath as I breathe and note how it soothes my wind stung cheeks as I pass through it. I love the change of all the seasons because they bring something different to enjoy. Peacefulness and the beauty of a recent snowfall is what I love about winter. I don’t focus on the difficult tasks of winter, I just try to manage them. for example, I keep my car in the garage during the winter so that I don”t have to clear ice or snow off the windows as I try to rush to work. Most things are manageable with planning! I would love that but have never experienced it here in Sunny So Cal. What a gorgeous, breathtaking sight! 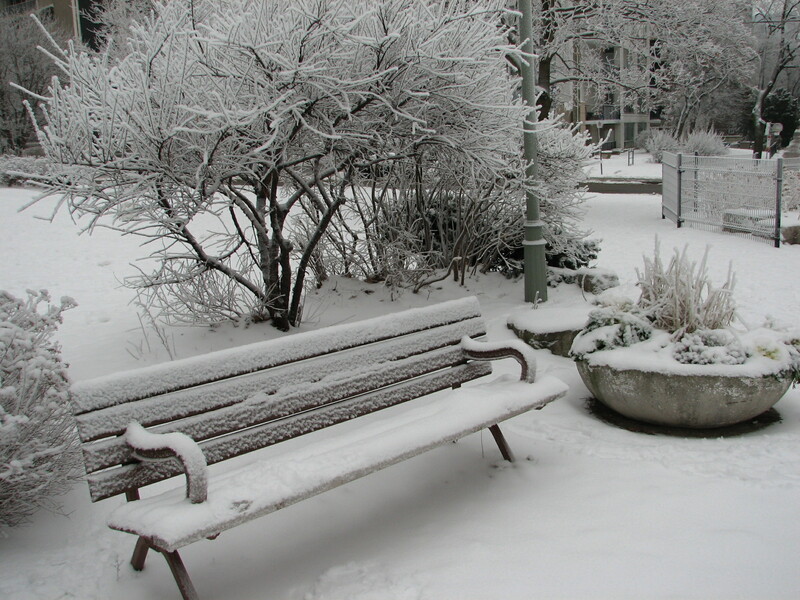 I love your photo of the snow covered bench. It makes you feel the cool and the beauty of a winter day. Thank you for sharing. Ah, this New England winter has been blissfully free of ice and deep snow…the latest is merely Nature’s fertilizer, soon to be absorbed so I can on with the what I wait for – playing in the dirt. But today’s snow ( like yours) is unexpectedly serene and welcome, in spite of the call of the garden.